Alas, the taste of spirulina. Everyone is always wondering “how does spirulina taste?” and I’m here to give you the truth. Not everything can be good right? I mean spirulina has so many benefits, somethings got to give, right? So does spirulina taste good? Absolutely NOT! This is the downside to spirulina. Most of the products out there are horribly disgusting.. I still remember opening my first container of spirulina powder and breathing in the potently horrid smell and holding my breath as I thought to myself that I might have to return this stuff. Not all spirulina is equal. There are many factors that differ in the environments in which spirulina is grown and this ultimately leads to spirulina being different. I’m not exactly sure what all causes the tastes to vary but I’m guessing the main factor is the water quality in which it is grown. I have had low quality spirulina that smelled just like pond scum and tasted like what I imagine pond scum would taste like. But I have also had high quality spirulina that tastes “good”. Well not good, but “OK”. The difference is that the taste and smell isn’t so pungent. Its milder and MUCH more bearable. 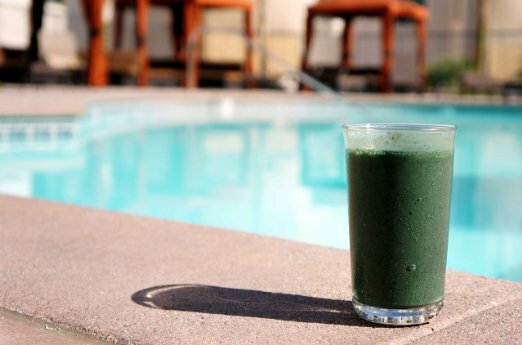 I don’t think you will ever find a raw and natural spirulina that actually tastes “good”. So if you have had bad experiences with spirulina don’t give up! Check into the brand of spirulina that you bought. Chances are you bought a low quality spirulina product that was grown in less than desirable conditions. And now you think that spirulina is all around awful and there is no chance you will ever try it again. Well I want you to give it another try. It doesn’t have to taste like scum. Just don’t buy the stuff that comes from undisclosed locations and doesn’t provide any information on the conditions its grown in. Buy from reputable sources. 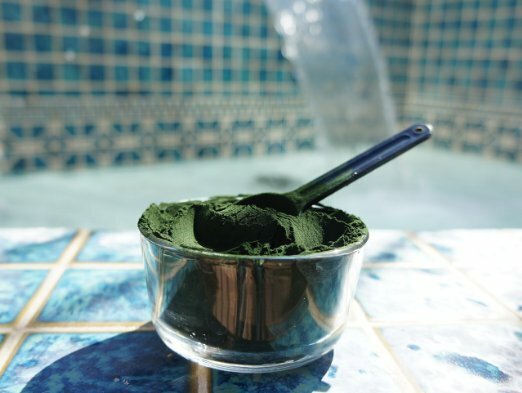 Whats the best way to take spirulina? Remember, I said that even the good spirulina tastes “OK”, it doesn’t taste great. Its not something that you are going to want to mix into water and enjoy. I have found spirulina smoothies to be my favorite way to take spirulina powder. If you use other good ingredients in your smoothie they will do a good job at somewhat “masking” the spirulina taste and you will be just fine. But if you don’t want to bother trying to find a good way to make spirulina taste good you can always get spirulina tablets or pills. Once again, quality matters here as well. If you get cheap tablets or pills theres a chance you will be able to taste the spirulina. But there are good products out there where you literally won’t taste any spirulina when taking them. If you are looking for good quality spirulina I have reviewed products that I consider to be the best. These products will not taste like pond scum. They are what spirulina should be like and what people need to try in order to actually like it. NextWhat is the Best Way to Take Spirulina Powder? Hi, nice post I think when you try Something like spirulina, you can’t really expect it to taste good but you have some good tips hear to mask it in a smoothie or take it in pill form. I like this idea as you can still get the benefits without the unpleasantness. I do this with cod liver oil it’s good for the joints but isn’t pleasant as a liquid so I buy it in pill form. I agree. You can’t expect every thing to taste good. And sometimes you have to sacrifice good taste for good health. Cod liver oil is very healthy. I’m glad to see you care about health. Hahaha that’s not ideal… The smell, that is. I’ve had success with spirulina in smoothies. I think spirulina comes in some Odwalla smoothies, and I used to drink a lot of those. Tablet form sounds ideal too. The question is: Is Spirulina Worth It? Why take it if it doesn’t smell or taste great? Most people take spirulina for the health benefits. I don’t think there are many people that actually like the taste. I’ve never heard of Odwalla smoothies before. I’ll have to look into them.